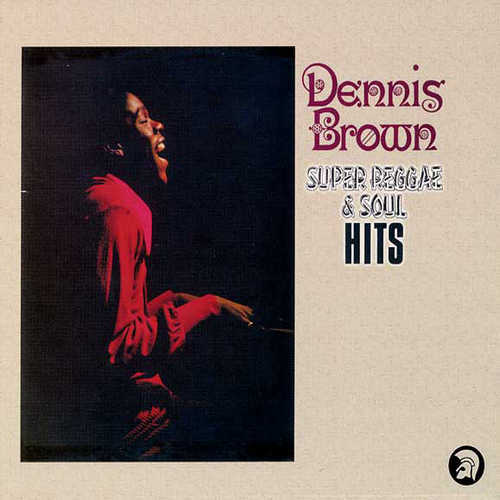 Honoring the ‘Crownprince of Reggae’ on his earthday, here’s a review of a – not really obvious – classic album of the sorely missed Dennis Brown, which was produced by Derrick Harriott. Trojan sometimes get a hard time from reggae fans for repetition of tracks on their compilations — but when Trojan get the selection right — they REALLY get it right, as the bonus cuts on this album prove, showcasing rare reggae music at its peak of creativity before the genre had hardened into cliché and dogmatic conservatism. Arguably — This aforementioned “new conservatism” could be said to be all too evident in a large percentage of current European “new” steppers/ roots releases, as well apparent in a majority of thoroughly unchallenging contemporary JA bashment and one drop music — Essential qualities of originality, drama and inspiration seem conspicuously absent in a lot of reggae music of the last three or four years. In contrast to such a current trend, Trojan have dug up some strong tracks from the dusty, obscure vaults on this D.Brown re-issue. Some of the poppier tracks on the album are saying very little, it’s true, and it sounds as if at the time of cutting the album, Dennis Brown’s direction was unresolved, uncertain and undecided — It seems as if he was being presented as a combination of John Holt and smooth middle of the road US R n B stars like Lou Rawls. 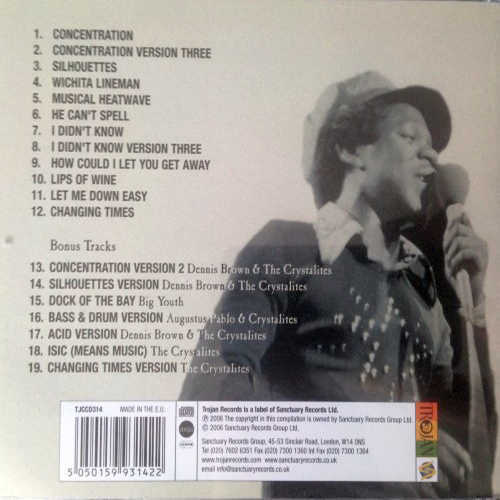 However, these poppy, bland additions to the album can easily be overlooked when compared with the radical raw power of the added bonus tracks — we get three thundering, raw soul roots-funk cuts to “Concentration” and some deeply innovative dubs such as “Acid”, “Bass and Drum” and “Isic (Means Music)”. Augustus Pablo and the awesomely tight Crystalites contribute some warm, soulful yet blisteringly funky and heavy cuts — Shades of the legendary tightness of the JB’s here! Like some of the extra bonus tunes on the recent Big Youth re-issue, these tunes are hard funk edged Roots Rockers, yet with an added touch of Blue Note acoustic bass influence in the arrangements. Think touches of Chico Hamilton’s harsh snare and rimshot work with some of the spaciousness and dramatic unpredictabilty of Charlie Mingus, albeit in a JA incarnation. The sound quality on this re-issue is warm, deep, rounded and punchy too, which, if you are prepared to overlook the poppier tracks on the album (about five of the tracks are dull) makes this is a worthy purchase. Conclusion Despite the inclusion of some poppier tracks, this album is definitely worthwhile checking.